10/16/13 Update: President delivers fact filled speech to Senate, announces strategic plan, end to athletic subsidies! Pac-12 media contract revenues from ESPN/FOX, our Pac-12 network partners, the new Rose Bowl agreement and the new College Football Championship agreement will substantially increase funding for athletics. In several years, there will be net funds transferred from athletics to the broader university community for academic and support purposes. Provost Randhawa and Athletic Director Bob DeCarolis and colleagues will determine future uses of those funds. Together, these factors will position us to provide an average compensation increase for faculty of 3% or more in each of the next several years beyond 2014. Good thing UO has a faculty union. In my view, the administrative governance responsibilities only work when important policies and practices are informed by consultation and advice from the faculty, staff and students. Such consultation and advice can only be meaningful if it takes place in a spirit of transparency and knowledge and in a timely manner. There’s not much use in consulting after the fact – or not much use consistent with these ideas of governance, anyway. So there’s an essential advisory role for the senate, even on administrative matters – an essential role on those matters that are central to the execution of our mission, like budget and finance, space and capital planning, athletics and of course participation in the selection and the evaluation of academic administrators. 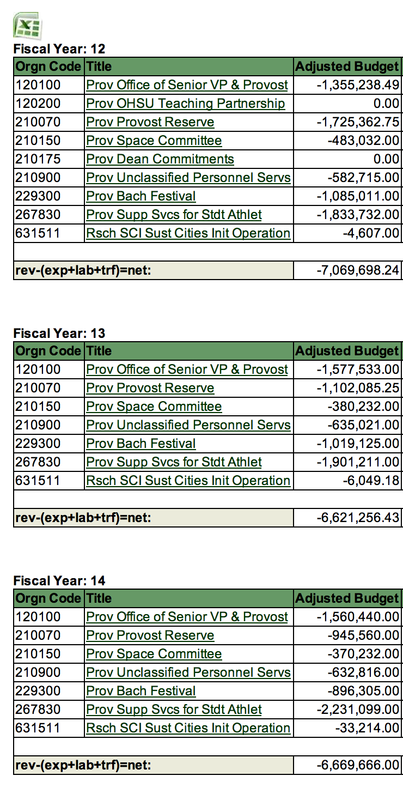 1) I notice that the budget for the Jaqua Center athlete only tutoring has increased from $1.8M in 2012 to $2.3M for 2014. 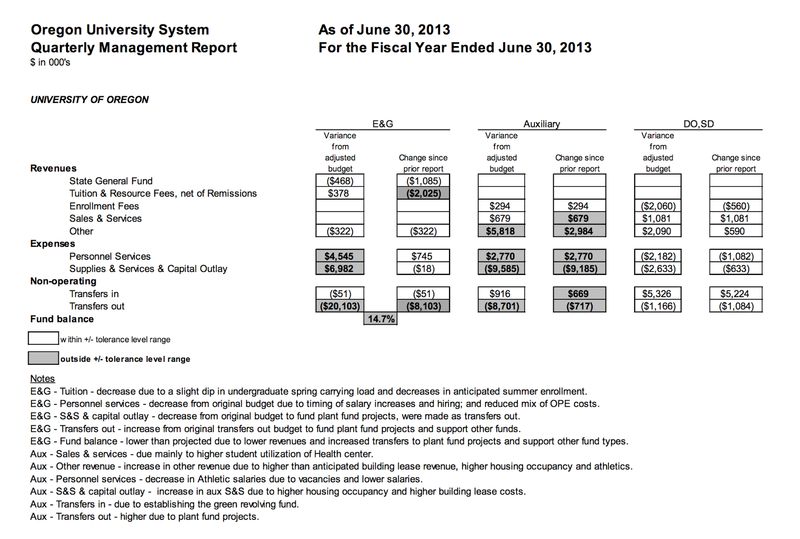 As you know this money is paid by the academic side, specifically out of the Provost’s budget. I’m wondering if you know the reasons for the increase, and whether or not additional increases are forecast? 2) You mentioned that there had been a dramatic increase in the number of “students of color”. I’ve heard that there was a recent change in the definition used to classify these students. Do you know how much of the increase is driven by this change? Is this still the plan, and if so what is the new target date? 4) You discussed planning for the new board. Who is in charge of drafting the board by-laws, and interfacing with the members, and is there a plan for involving the Senate in those discussions? I’ll post the answers when I get them. I hope your academic year is off to a great start. I’ve enjoyed meeting new students and welcoming our outstanding new faculty and staff members to campus at events marking the beginning of school, from “Unpack the Quack” and our neighborhood welcome walk to the annual new faculty picnic. Since the close of our previous academic and fiscal years, we’ve made significant progress on a number of fronts that affect the university, and I’m pleased to take this opportunity to share a few highlights with you. I frequently mention our dual obligations of access and quality that are the foundation upon which our university is built. As we now plan for the UO’s future, it is critical that we elevate both, for quality that is limited only to those with the means to afford it does not serve the public interest, and access without excellence is a hollow promise. We are on the right trajectory, as this year’s freshman class demonstrates. Numbers won’t be final until the fifth week of classes, but we can say with confidence that this incoming class will break records in several key areas linked to both quality and access. It is the most academically prepared class we have ever enrolled, with an average 1126 SAT and 3.6 GPA. Nearly 27 percent of freshmen are from underrepresented populations, and among Oregon freshmen, 37.6 percent are Pell eligible. Our total enrollment will hold steady at about 24,500 as planned, with about 5,200 new students, 54 percent of them Oregonians, coming to the UO. We are focusing intently on reducing financial barriers to attendance for Oregon residents, who continue to be hit by ongoing reductions in state funding that have shifted the burden of paying for education onto the shoulders of students and their families. This year, we increased financial aid to in-state students by 75 percent through scholarships aimed at high-achieving Oregon students, such as Summit and Apex, and the outstanding Pathway Oregon program. It was a summer of construction around campus, with about $300 million in physical improvements in the works. Recently launched projects include renovations and classroom expansions at Straub and Earl Halls, a major expansion of the Student Rec Center, significant upgrades and expansions of the Science Commons and Research Library and the Museum of Natural and Cultural History, and maintenance involving everything from seismic upgrades and new roofs to sewer-system improvements. Soon, the long-awaited renovation of the Erb Memorial Union will begin. I anticipate that such infrastructure improvements will become easier to realize as we adopt a new governance model that will provide greater flexibility in the way we manage the institution. The long-sought move to governance by local institutional boards was approved by the legislature and signed into law this summer. I am grateful to the Lane County delegation and many other supportive legislators, Governor Kitzhaber and his staff, the UO Foundation, and the UO Alumni Association for their partnership in bringing about this momentous change this spring. The governor has appointed a 14-member board for the UO that reflects a remarkable range of experience and expertise. Ten of our new board members are alumni, and all bring a commitment and dedication to the future of this university that will serve us, and the state, well. I look forward to working closely with them as we determine new ways to finance the institution and support programs and practices that will strategically focus our resources to improve access, elevate excellence, and secure our position among our peer research universities. We must develop the means to better support research, to address threats from sequestration and cuts in federal funding, and to close the innovation deficit that compromises our nation’s capacity to remain the world’s leader in innovation, creativity, and discovery. At the heart of the university’s ability to carry out its mission are, of course, our faculty and staff. I am pleased that we are beginning the new academic year with new contracts for our union-represented faculty and staff, and with a schedule of compensation increases in place for faculty, classified staff, and officers of administration. At the same time, I recognize the pressures that faculty and staff are feeling from successive years of declining state investment and burgeoning undergraduate enrollment. Your work with our students, in the classroom and in informal settings, is what distinguishes this university and creates the quality educational experiences that will define your students’ futures. Improving the teaching and research environment for our outstanding faculty and staff is among my top priorities, and essential to our success in realizing our aspirations of access, excellence, and innovation. 7/23/2013: Pdf here. May 8th 2013 Senate discussion of this resolution, which passed 19 to 4, here. Video here. Of course these are just words and not actions. And the words are very different than the angry, dismissive ones we got from Sharon Rudnick and Tim Gleason today, when these subsidies were raised in bargaining. This letter is now 2 weeks old. So, has Gottfredson’s position on this changed, is he telling different people different things, or did his bargaining team not get the memo? 9/26/2013: As near as I can tell UO has been spending about $50K a month on Sharon Rudnick and Kate Grado from HLGR to do the negotiating with the union, and another $30K or so a month for lawyers and consultants to write Barbara Altmann’s “fact check” website. That’s a lot of money for the rather pathetic FAQ they’ve posted on the union contract, here. Q. Won’t faculty salaries remain far below our peers and AAU comparators? A. The salary package — which includes across-the-board raises, merit increases, promotion raises and money for tenure track and tenured faculty equity and NTTF salary floors — will move faculty salaries in the right direction. 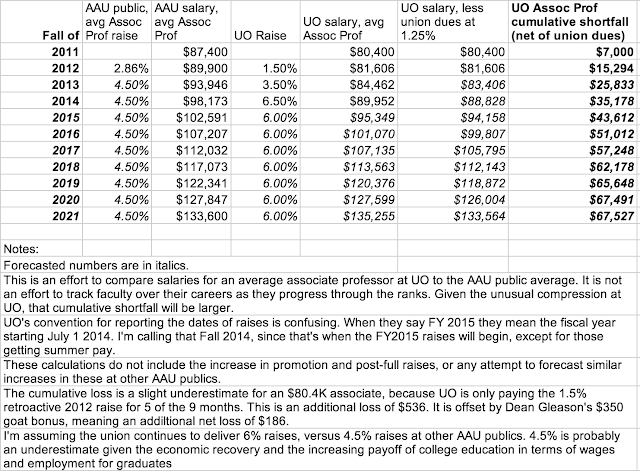 It is also important to look at total faculty compensation (salary + benefits). When benefits are included the gap closes substantially between the University and our comparator universities. c. Step 3 (as early as FY 2012/13 and no later than FY 2013/2014), increases based on internal equity and merit. The total amount of funding made available for salary increases by the College in Step 3 will be at least the amount necessary to increase the College’s average salaries to make up the remaining distance to the average salaries of the OUS 8 comparators. Q: How long, Provost Coltrane, how long? 9/23/2013: A: Seven years and $70K, best case scenario. Interim Provost Scott Coltrane’s email about the new faculty contract is here. He offers to answer questions. I’ve got a few, and I’ll keep you posted on the answers. You’ll have a chance to ask him yourself during the public presentation he will have to make as candidate for the permanent UO Provost job. Meanwhile, here’s the math on how long it will take to get to comparators, and an estimate of what you’ll lose meanwhile – about $70,000, lower bound. The next contract will need to be 10%, 10% to reach this goal, which the administration has purported to want to achieve since the 1998 Senate White paper. In the scheme of a $800 million budget, we’re not talking about a lot of money. But it’s not going to happen unless we spend the next 18 months exposing Johnson Hall’s money wasting activities, and convince the new UO board that faculty are more important to their university’s future than more administrative bloat, sports subsidies, and expensive White Stag distractions. Coltrane Op-Ed supports admin over faculty, sports over academics. 9/15/2013: OK, maybe not exactly, but his selective reporting of data is rather astonishing. His Op-Ed is today’s RG is here, my response is in their comment thread. Please post your comments there, not here. We all agree that students deserve a meaningful classroom experience and that the UO needs to recruit and hire more tenured and tenure-track faculty. Students, faculty, and our state deserve no less from an AAU research institution. The negotiating teams return to the table on August 29. I’m optimistic that these talks will yield a faculty contract that builds on our areas of agreement and propels us into the next decade as a stronger, more united and more equitable institution. strengthen the University of Oregon and its academic mission. We are in this together for the long term and I firmly believe that our new labor contract will be a useful tool to ensure equity and fairness, standardize procedures, and set mutual expectations. include research as well as teaching. We’d like to think that has always been the practice, but it is useful to reaffirm the general principle. Faculty should have the latitude to delve into controversial issues or explore new and emerging areas in their fields of research without fear of censorship or retaliation. And it is important to reaffirm that faculty shape the content of the curriculum. President Gottfredson and I also agree with the faculty that shared governance is essential to the wellbeing of the academy. I am certain the contract language will underscore the faculty’s front-line role in this regard. We believe that faculty, working with the President, should have responsibility for setting academic standards, creating new classes, determining what material should be included and how classes are taught. The faculty also assigns grades to students and determines who should be awarded degrees. increase in support from the current 85 percent pay. The University and the faculty union, United Academics, broadly agree about maintaining the integrity of the tenure review and promotion process and the contract reaffirms procedures to protect that tradition. ensures NTTF are eligible for professional development funds. The contract will also set down policies for regular review and appointment of non-tenure track faculty with appropriate faculty involvement and oversight. Along with better pay, it’s important for NTTF to have stronger job security and potential for promotion. deserve no less from an AAU research institution. The negotiating teams return to the table on August 29. I’m optimistic that these talks will yield a faculty contract that builds on our areas of agreement and propels us into the next decade as a stronger, more united and more equitable institution. Priorities: Later this month, our leadership retreat will address the most pressing priorities for the Provost’s Office during this coming year. The group in attendance will include the Leadership Council augmented by faculty, staff, student, Foundation and Alumni Association leadership. I will present some ideas such as review of the Academic Plan and the Big Ideas, office and classroom space, etc. The group will have an opportunity to add topics and to do an initial prioritization. I have already spoken with Robert Kyr, President of the University Senate, about an online ranking process of these priorities, to be run by the Senate in September, involving the entire community. From all this input, the President and I will settle on the priority topics for this year. That would have been last September. Just in case anyone needed a reminder about the lack of faculty input into UO’s priorities – a question which Hubin finessed in the accreditation report, and which Rudnick made the mistake of bringing up at the bargaining table. Too bad Coltrane doesn’t start the job until July. I am delighted to announce that Scott Coltrane, dean of the University of Oregon’s College of Arts and Sciences, has accepted my invitation to serve in an interim role as the UO’s senior vice president and provost beginning July 1. He will succeed Jim Bean, who will leave his current position of senior vice president and provost at the end of June, to return to the Lundquist College of Business. Dean Coltrane will serve in the interim position as we conduct a nationwide search for a permanent senior vice president and provost. I would like to thank all those who submitted nominations to fill this interim position and I’d especially like to extend my appreciation to members of the Faculty Advisory Council who served as the selection advisory committee for this appointment. The provost is the UO’s chief academic officer, heading our academic programs and overseeing the quality of our teaching and research. The provost ensures that we maintain a high quality faculty by providing leadership in appointments, promotions, working conditions and tenure. Dean Coltrane has served since 2008 as the head of our College of Arts and Sciences. He has also served as a member of the Executive Leadership Team and has extensive experience and familiarity with the fundamental issues facing our entire university – from the growth of recent years, to the space and staffing issues we are currently addressing, to facilitating our research mission. A prominent sociologist, Dean Coltrane’s own research has focused in part on families and fatherhood and the domestic divisions of labor and gender inequality. Prior to joining the UO in 2008, he served for 20 years in a variety of teaching, research and administrative positions at the University of California at Riverside. Please join me in congratulating Scott Coltrane and welcoming him to his interim role as senior vice president and provost. Bean keeps his parking spot for 4 more months, but we should have a new interim by July 1. The obvious candidate is CAS Dean Scott Coltrane. Any other ideas? 3/2/13. 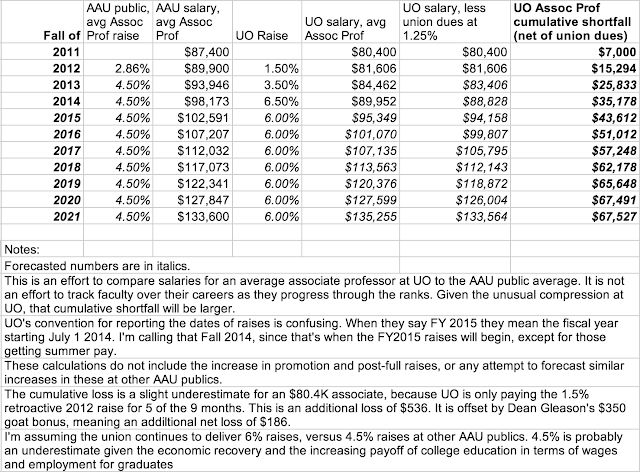 UO can’t give raises because of the union? 10/12/2012: I’ve heard many reports of recent statements by Bean and Gottfredson that they can’t pay us the round 2 and 3 Lariviere raises because of the union. At the Head’s retreat, for example. Please post comments or email me about other stuff you’ve heard from admins on this, with what was said, by whom, and when. The more specific the better. Q: Why aren’t you providing increases to faculty as well? A: Our faculty recently unionized. Most adjustments to faculty salaries will need to be negotiated with the union as part of our initial collectively bargained contract. 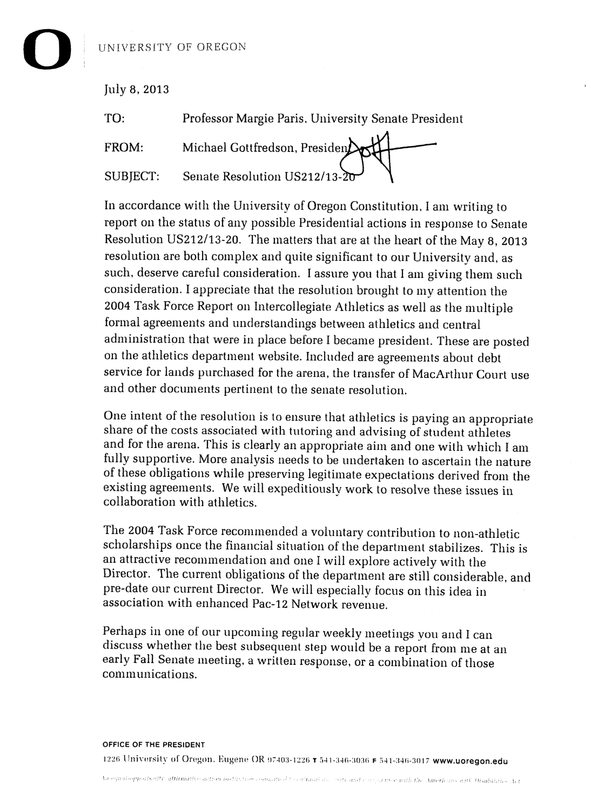 On the other hand UO has the money set aside – for TTF and NTTF – and it’s hard to see how Kitzhaber can let the coaches get 21%+ and then say no to the professors. And the Johnson Hall dwellers are apparently not saying the problem is the money or the Gov – they’re saying it’s unionization. Is there a legal prohibition against giving raises without a contract, now that we’ve gone union? No. Labor law does say that, because of the union vote, faculty now have the right to ask the union to file a grievance against the administration for changes in the terms of employment – which would include a raise. I’m no psychology professor, but I don’t think people file grievances about getting raises often enough to even get a note in the DSM. 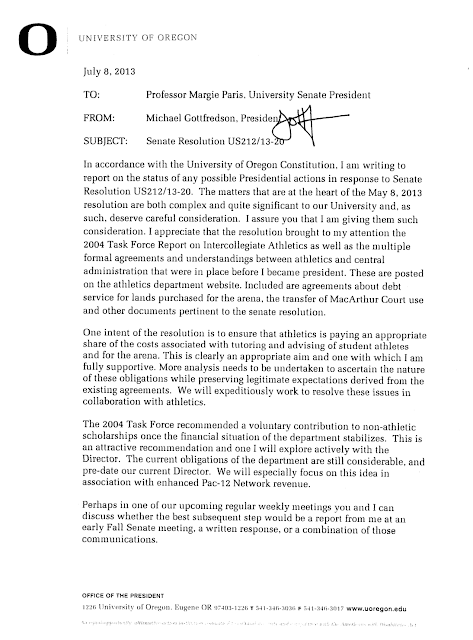 If there was a pre-existing agreement to give raises, does UO have to follow through with it now that we’ve got a union? Maybe. The Missouri article stating that UO has the lowest salaries in the AAU has caused quite a stir (we have since verified that they were correct). Low salaries were always thought of as just Oregonian. But 34 out of 34 is a whole other thing. We cannot have this. Richard’s reaction was “this is job #1.” Richard will likely have an announcement on how we are attacking this when politically feasible (after last gavel). Please communicate to your faculty that the Missouri article really got our attention. This may require disruptive solutions. The ERB is not going to take Bean’s word any more seriously than we do, but there’s more substantive evidence that faculty had reason to expect raises. 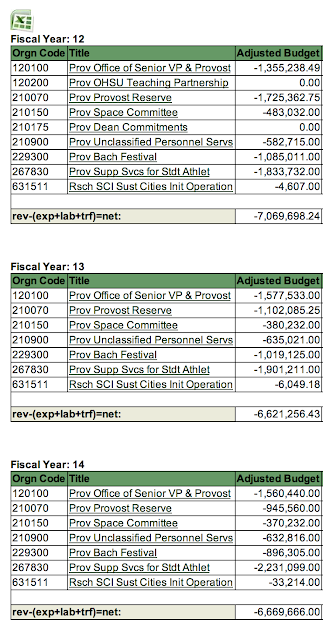 I’ve got a public records request in for the spreadsheet showing what CAS had planned for rounds 2 and 3 of the Lariviere raises, for each TTF, by name. More than a month, and CAS Dean Scott Coltrane is still refusing to turn it over. If you’ve got a copy please send it along. Thanks! 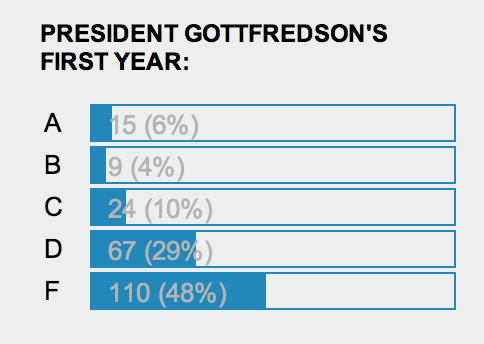 I’m also trying to get more information on who is advising Gottfredson on labor law – I hope he knows better than to rely on Randy by now. My guess is that it’s Sharon Rudnick of Geller’s favorite firm, Harrang, Long, Gary and Rudnick. I’ve made a public records request, but Dave Hubin’s office wants to charge me $70 for the contracts – and it will be a lot more for the invoices and memos. You know where this is going – pony up, comrades.